Young Tabby Aykroyd has been brought to the dusty mansion of Seldom House to be nursemaid to a foundling boy. He is a savage little creature, but the Yorkshire moors harbor far worse, as Tabby soon discovers. Why do scores of dead maids and masters haunt Seldom House with a jealous devotion that extends beyond the grave? As Tabby struggles to escape the evil forces rising out of the land, she watches her young charge choose a different path. Long before he reaches the old farmhouse of Wuthering Heights, the boy who will become Heathcliff has doomed himself and any who try to befriend him. 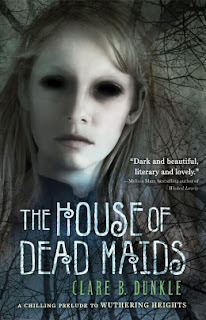 When I first heard about THE HOUSE OF DEAD MAIDS, the English major in me squealed with joy. Holy sweet baby Jesus! she said, I love WUTHERING HEIGHTS. THE HOUSE OF DEAD MAIDS is going to be awesome! First of all, this story is not the sort of tale you should read at night. A wonderful woman named Barbara, who coordinated the tour I participated in, warned me not to do it. She said: "A word of advice: don't start reading it too late at night." I wasn't sure what to make of her warning because I don't get spooked by books. I'll cry because of a book; I'll fling a book against a wall because something about it's agitated me; I'll even squeal with joy... but I don't get truly scared. Nevertheless, I listened to her advice. Kind of. The first time I sat down to read this novel, it was during the light of day. The illustrations for each chapter made me wary enough to be gnawing on my bottom lip as I read on. I loved them, and I think they added an exciting aspect to the reading experience. My story aside, I truly enjoyed THE HOUSE OF DEAD MAIDS. Heathcliff was not only the brat one comes to know and love, but he was also young enough to still retain some sort of child-like innocence. It was at these moments, when said innocence--which was really more of him not being annoying around Tabby--shone through, that I adored him. I felt miserable for his fate. But then he'd act like a heathen again and I would forget my regret. One particular description of the house stuck with me, even now, a few weeks later. I felt like the house truly was another character in the story. It added more excitement, me thinking it was alive. I never once thought that there were ghosts when I read WUTHERING HEIGHTS. After reading this novel, however, it will be interesting to see if I still feel that way. THE HOUSE OF DEAD MAIDS is short and definitely worthy of being labeled as the prequel to WUTHERING HEIGHTS. Heathcliff is such a rich and intriguing character in Bronte's novel... which I suggest you read if you still have yet to do so. To learn more about his possible origins in Clare's take of the book definitely broadened my understanding of the tale and of his position. I think that, whenever I decide to reread WUTHERING HEIGHTS, I will definitely read it with new, open mind. Thanks :) I hope you enjoy it! Was a pretty fun read. Really want to read this now. I love scarey. Thanks for your review. Sue, then I suggest getting it and reading on a cold, rainy night after everyone's asleep. Nice review. It sounds amazing and creepy. I had no idea Ms. Dunkle had another book out! Wow! I must pick this one up. Thanks for highlighting it! The cover of this book has haunted me since I first saw it. I think I might have to pick this up based on your review. Looks like a good read, I like books that leave you feeling all creeped out! Then you're gonna love this one, Beth! This book first got my interest on other book blogs because of the cover, but I think I'll buy it today now that you've highlighted the creepy aspect. Books usually never scare me either, so I'm curious. Hehe, hope you like it! Just make sure to read it LATE (like when everyone's asleep) at night. Hush, Hush & Crescendo Giveaway Winners! Author Interview with Clare B Dunkle + Giveaway! Guest Post with Shelley Munro + Giveaway! Giveaway: Hush, Hush & Crescendo! The Battle of the Sexies... Winners! The Battle of the Sexies: Thank you!